Not everything in my life is election records, reviving the Republican party, or messing with Texas. One of the more pleasant aspects of my life is being an assistant scout master of a local boy scout troop. Recently, our troop hosted a clinic for WeBeLoS to earn their engineering activity pin. 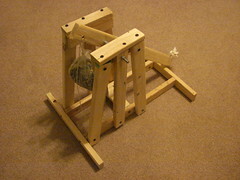 For the catapult requirement, the boys built a table top version of a trebuchet. Replacing the sling with a bucket was a simplicifation in order for 18 boys to complete the construction within 2 hours. I thought others might enjoy pictures of the final product. The dimesions are 15.5 inches in length, 13.5 inches high, 13 inches wide, and the swing arm is 20 inches. The boys then hurled stale marshmallows all about the room. Click on the picture see the whole Flickr set.